Maserati Multi70 finishes the Transpac Race in Honolulu in third place. Giovanni Soldini’s Maserati Multi70 crossed the Transpac Race finish line off Honolulu under a full moon at 11.18 and 55 seconds Italian time on July 11 (23.18 and 55 seconds, on July 10 in Hawaii). Wind conditions during the 2,225-miles long race were in the 13 – 21 knot range – excellent for fast multihull sailing. Soldini’s men made good use of Maserati Multi70’s capability to fly above the water on its hydrofoil dagger boards and on the second day at sea they edged ahead of their main rivals – the non-foiling American trimarans Phaedo3 and Mighty Merloe. However, the situation changed on Sunday when Maserati Multi70’s starboard rudder assembly was destroyed by a collision in the dark with an unseen solid chunk of ocean debris. The crew stopped the boat and despite strong winds and choppy seas they managed to retrieve the snapped off rudder blade remained attached to the boat by a control line. It took a little over an hour before the Italian boat was back in the race and although limited by the missing rudder on port gybe, Maserati Multi70 could sail at full speed on starboard gybe. The sailors pushed the boat to its limits to try to claw back some of the miles lost to their rivals and at one point looked to be gaining ground. Ultimately though, they had to settle for a third-place arrival in Hawaii. Soldini said the crew was tired but happy to have made it safely to Hawaii, but also disappointed to have lost so much time and distance with their broken rudder. “We are a little sad to have lost out so much because of the rudder,” he said. “I think we had sailed a good race up until then and we were enjoying the battle with the other two. We lost an hour retrieving it – that is 25 miles in these multihull boats”. 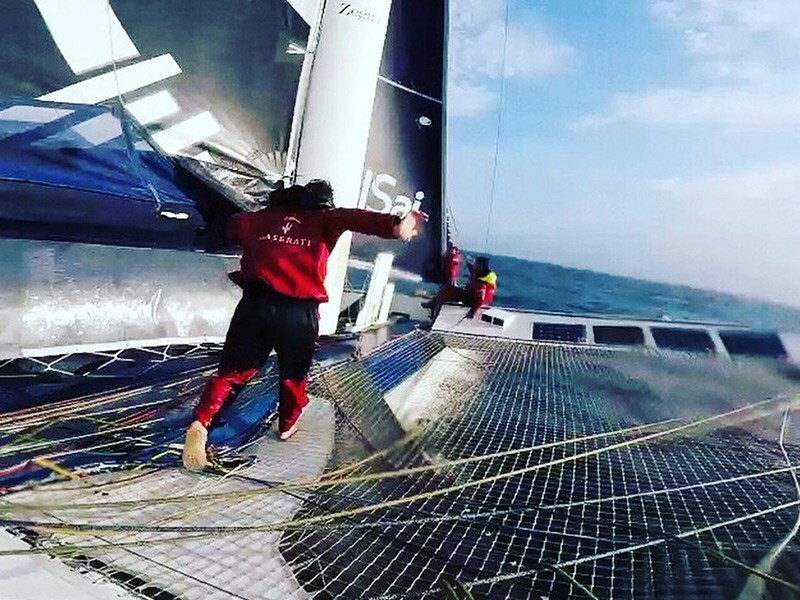 Although they did not get the result they were looking for, the Maserati Multi70 crew sailed a total of 2,636 miles on the four-and-a-half day crossing and were able to gather lots of valuable performance data that will help with their quest to fully master the art of offshore foiling. The challenge is supported by Maserati which, as main sponsor, gives the boat her name, while UnipolSai Assicurazioni is sponsor. The official suppliers to the challenge are Ermenegildo Zegna for clothing and Boero Bartolomeo S.p.A. for hull enamels and paints.